In today’s Divi tutorial, we’re going to show you how to add a search field to your secondary menu. The secondary menu is also known as the header of your page and the place where you try to fit in some practical information about your website or company. Adding a search field to it might be a request you’ve had from a client or a need you have for your own website. Either way, we’ll show you how you can easily integrate this search field into your secondary navigation when you’re using the Divi theme. Adding a search possibility to your secondary menu is one of the things you might have tried to do. But unlike the primary menu, the header doesn’t have a separate page within WordPress that helps you add things manually, without having to add PHP code lines to the header.php file of your website. However, adding a search possibility in your secondary menu can be an interesting thing. Let’s take a look at some reasons on why you’d want to add one. You have all kinds of visitors on your website. Some of them are looking to explore things and take their time, while others want to find specific information right away. By adding your search field to the secondary menu, you’ll be guaranteed that the visitors who are looking for something specific, have the ability to do that right away. Since a secondary menu is located at the top of the page, the visitors that are in a hurry will appreciate the effort that improves their user experience. Of course, another thing you could do is add the search field to the primary menu. But in some cases, you might not want to do that. For example; if you want to keep the focus on your menu items or if you don’t want to mix the menu items with the search field. Another reason could be that you already have quite some menu items that make your primary menu look busy, and you don’t want to add a search field on top of that. Most people tend to keep their primary menu sober and make their secondary menu pop. Primarily, because they want to show the obvious difference between the two menus. And secondary, because the secondary menu often has some things they want to emphasize (such as the social media icons). When you decide to integrate the search field within your secondary menu as well, it’ll automatically be highlighted as well and it’ll stimulate your visitors to search and find exactly what they’re looking for. Go ahead and copy this PHP code line and go to your WordPress Dashboard. 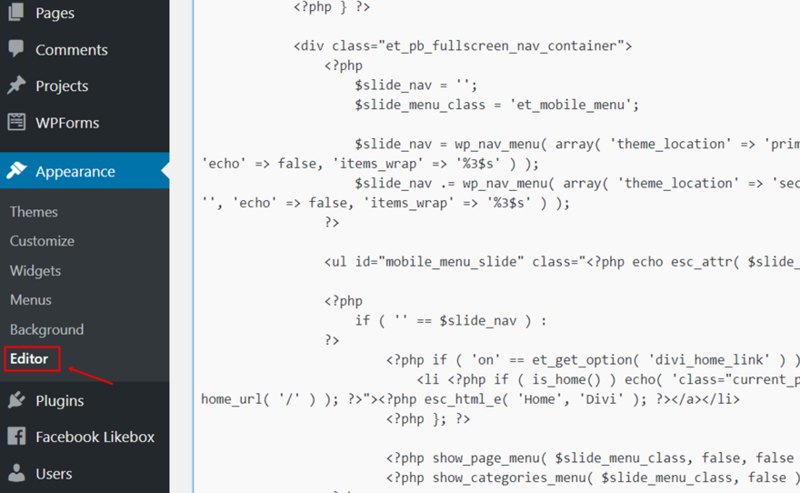 Within your WordPress Dashboard, go to Appearance > Editor > header.php. You can now place the code line wherever you want your search bar to appear. Since we want it to appear right next to the social media icons, we’re going to show you where exactly to place it in the code. We’ll need to place it right before the secondary menu, the container and the top header close. By default, the search field looks a bit outdated. You’ll probably want to change some things just to make it look the way you want it to and to make it fit with the look and feel of the rest of your website. These are three things you’ll probably want to change: the search label, the search input and the button input. The first element that is part of the search field is the search label. This is the text that appears that explains to people that they can search for anything on the website by using the field. However, this label is not necessary. Everyone knows nowadays how a search field works. You can always make the search label disappear by adding ‘display:none;’ to the CSS of that label. Or, you can change the appearance of the label. The class you’ll be needing to make any modifications to the search label is “.screen-reader-text”. Like shown in the example below, you can disable it from appearing. In this tutorial, we’ve shown you how to add a search field to your secondary menu. Besides that, we’ve also shown you how to modify the elements within that search field and presented you with an example of CSS code lines that you can just copy and paste for your own use. If you have any questions or suggestions, feel free to leave a comment in the comment section below! Good article, but you forgot to mention one thing. If you add the code your header.php file, when you update to a new Divi theme version, it gets wiped out, so no more search filed. Happened to me after doing a while lot of work to get it looking good. Suggestion. Copy the header.php file to your child theme then edit. This will preserve your changes after a Divi update. 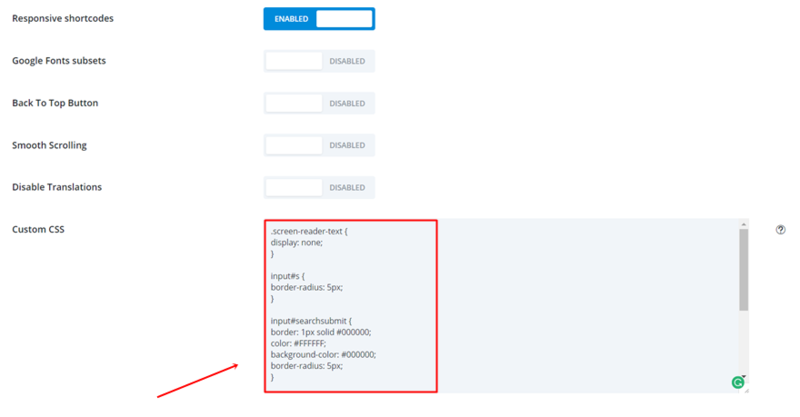 I’ve also used jQuery to append html code in the integration areas of divi options. Its useful when I dont want to create a child theme. I dont have the full code, because I don’t know how to get jquery and php working together, but here’s the jist of it. In this example You’re appending the WORDS ‘search form’ to the secondary menu. If anyone knows how to write the full code I’d love to use it. Some of the graphics aren’t rendering. Please fix. Great tutorial! I was looking for a way to place a search field to 404 page. Divi logo Manager, Where is ? Nice. But somehow the search field disappears on mobile. I assume this is intended? Worked well, until I upgraded Divi to 3.0.75, now it’s gone … any idea why? Now in divi last version, this search box is a native option.